In Volume 10 of this collection (which teaches you how to learn with the help of images), let's learn, easily and quickly, 100 new words about Music. This book brings together the two best ways to learn Spanish: - The Word with Image Method - The Bilingual Reading English Spanish Learning Spanish vocabulary with this book is very simple: - See the photo - Read the name in English - Read the corresponding word in Spanish Each new image will help you memorize a word in the new language. Just see the photo and learn a new word, then go to the next image and do the same. Step by step, you will see that you begin to understand and memorize more and more words in Spanish! Just see the photo and learn to speak in Spanish. 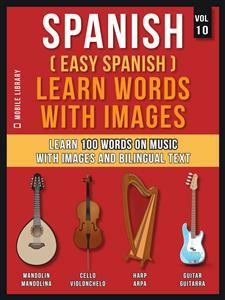 The easy way to learn Spanish!